Hey. This is a close up of my crankset. Which powermeter shall I buy? My guess is the Type-S spindle-only. If then, how hard/easy is the installation? I wanted to say thanks to Nicolas for all his work supporting this thread! He was the main reason I bought a Rotor 3d+ (not from P2M, sorry) and type S. The spider removal tool fit perfectly and worked like a charm (no heat) with a long wrench and a bench vise. The entire installation and syncing to the 510 was exactly as advertised and very simple. I think crank off the bike-->spider swap-->crank on the bike-->calibrated = <30 minutes. After several rides, all I can say is "It just works." I haven't found anything to complain about and if I did, I know I would receive immediate assistance. Thank you Nicolas for all of your help! I had read every post on here multiple times before ever pulling the trigger on my first PM. If somebody else is on here doing the same, just go with the Power2Max. It's a great choice. today my P2M showed totally wrong numbers (way too high). Zeroing didn't help. I then tried to calibriate via Edge 800, but it continuously returned - and still returns - a "calibration error 4"
I'm getting interested in a P2M for my new bike. Currently running Campy Chorus compact. I know that there is a new one taking orders that will work. 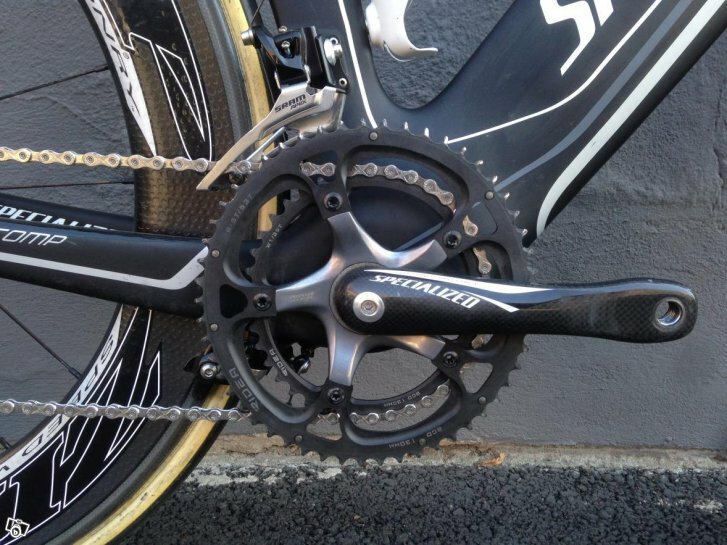 My question is how much weight does this PM add over the standard UT Chorus crankset? The BB is PF30. Will I need anything extra (eg: cups)? Are you still looking at late this month to get them out? @dangle: thanks very much for your kind words, it's great to hear you find our support useful and like your power2max! @axti: that sounds like a more serious issue. Can you please contact the support in your region? You will get a quick reply. @makoti: the Campagnolo power meter weight is on the site and is 636g for the crank arms, power meter, axle, and bearings. If you have Ultratorque cups you can just install it. Availability will increase over the next 3 weeks. received my type s today and mounted it up, really nice piece of gear and the praxis rings are beautiful as well. I'm having and issue though, it isn't necessarily related to the p2m itself but wanted to ask. I left trainer road setup to virtual power and compared it to the p2m with my 910xt, they were way off. Oddly unlike some charts I have seen they got closer as watts went up but still never matched. At 100 watts on the 910, TR showed 160. At 200 on the Garmin TR showed 277. math of my power and times in races says tr is closer to being right. so I then shut off virtual power and pair the p2m, they are still off between TR and the 910. Closer but still way off. I checked and both were displaying the same calibration figure (-1084 I think), have you seen this with a 910 or other Garmin before where it is so far off? We get this type of feedback initially when people first switch from a home trainer that estimates power to a power meter. The home trainer is built as a resistance unit and not a power measurement device. So virtual power has to rely on speed to power relationship estimates, but those can sometimes be pretty far off. I understand that, what I am saying is that even with virtual power off what trainer road and what the Garmin are showing are off. As in what is essentially two head units for the p2m showing vastly different figures. Basically right now I can't use the p2m outside because the reading on the Garmin is worthless. There has to be something that trainer road does, because the power meter transmits the actual wattage number. I don't know trainer road but it sounds like there is a compensation factor that is active or something. Can you please ask them? I do have UT, so that should be easy. If I extrapolate what I saw tonight and assume that the Garmin is right I'd have an ftp of sub 180 and at 200lbs went 2:32 at Florida last month... if that is true I'm the most aero person on a bike ever. I completely understand that you deal with people all the time going from virtual to actual power and it being off, this isn't what is going on here. Also I'm not sure if you stopped or what but my unit had no calibration info, it was blank. 1) if possible, pair a second Garmin with thy power meter and see if it shows the same values as the 910 or not. 2) ride a steep and long climb and record system weight before. Compare data with a formula for plausibility to reassure yourself. I can share a more detailed protocol. I don't have access to another Garmin easily so I'll have to try 2. Do you have any idea why my unit came with no calibration information? do you have power smoothing setup the same on both the 910 and TR? Can you post links to the garmin file and TR workout? I didn't see anything about smoothing in the 910. I believe it was off or lowest setting if there is no off in tr. I was able to hold constant power and that wouldn't bring them closer. And no don't have files, I set it up just to tests last night but have a knee injury so I wasn't doing a real workout. I was going to just experiment and do a free ride 30 but when I saw how far off they were I got distracted and never started either. With mothers day I probably won't be touching it again until Sunday night to actually save a workout. edit.. checked TR before I ran out the door and it says smoothing is off, the 910 was showing display block "power" from what I can tell smoothing would be the 3,5,10 whatever second average ones. Ok, I just posted on the TR thread but now that I've read this more I think you've troubleshooted this as far as you can. Good deductive reasoning on your part, looks like you hit everything I've thought of. E-mail me at nate@trainerroad.com. I'll send you the official ANT display simulator that you can pair your P2M with. It's a windows desktop app that connects with an ANT stick and will read in power data. You can then pair it with the Garmin at the same time. As long as you're sure power smoothing is off, then you'll know that your 910xt is having problems. I'd then check for a firmware update on your 910xt, if that doesn't do it I would contact Garmin Support and try to get another. Thanks Nate I will shoot you an email. I believe I have the latest firmware in the 910 I forgot to check it in the unit itself before I left but when I checked my last uploads on connect it said 3.0.0 so for now assuming it is. I saw nothing about smoothing as I mentioned only options to display as power, power 3 sec avg, 10 sec avg, 30 sec avg and just avg. If anyone else reading knows if there is smoothing some place I'm not seeing. Smoothing is another term for averaging. 3 second average = 3 second "smoothing"
The wattage is usually pretty jumpy if you are using "instant" and many people prefer to just know the average over 3 or 5 or 10 seconds. I feel like using power smoothing/averaging helps prevent over-corrections. Having 3 second averaging on one unit and instant on another would probably provide somewhat different display numbers. I think people asked for the power files because that would be a better way of telling if there were actually major differences. Even if both units were set to display 3 second average, there would still be some discrepancy. From my experience with a Fluid2 (not sure what your trainer is) and TrainerRoad, the TR estimate was much higher (especially at lower speeds) when compared to the P2M. They are both great training tools though. That is what I thought after going through it, thanks for confirming. If that is the case then both were set to no smoothing. I Was able to hold say 100 watts displayed on the 910 and on virtual power it showed about 166 I think it was on TR, with it set to the p2m it was a little closer like 150, so still over 50% off. That was holding a constant 99-101 on the garmin display. just installed my new p2m with rotor 3D+, and it only shows some data on my computer(garmin500). Cadence, but no other data. - Do you have power displayed? If so, does it show "-" or "0"? - Does cadence come from the power2max or do you have another cadence sensor? - Did the green led flash when you installed the battery? I just recently purchased a FSA Goss.. S-Type about 2 months old and after a couple of rides the left crank has started to come loose. I had it installed at one of the local bike shops here in SD and I was out on another ride Saturday when it started to come loose again. I had another bike shop get it back on, but this has caused me to not have very much faith in how long of a ride I can go without it coming off again. The mechanics at the bike shops are highly respected among the triathlete community in San Diego so I don't think it's an error on their part, but what do you think the cause could be that cause this to keep happening? Possible defect with the FSA crankset? what frame and BB do you ride the Gossamer with? Could there be any fit issues (e.g., a BB386EVO bottom bracket?). Also, have any of the mechanics taken off the cranks and checked if the axle looks ok? My only guess is that there could be an issue with the axle preventing the cranks to stay put.